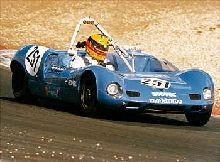 Another small British manufacturer which specialised in simple, kit-built sportscars was Elva. Elva evolved from a clever design by Frank Nichols in 1955. 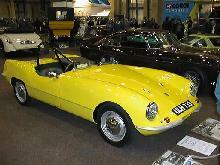 The first production model, the Courier, was launched in 1958 and used an MGA engine for its power. Elva produced the Courier in its original form (MkI and II) up-until 1960, after which it was superseded by the less successful MkIII and IV versions. 1962 had witnessed a take-over by another small company, Trojan. 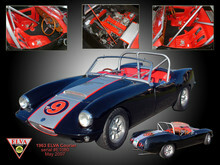 In 1964 Trojan itself was taken over by Ken Sheppard Customised Sports Cars, based in Hertfordshire. By 1965 production of all Elva cars had finally finished. Following the disastrous forced liquidation of Elva Cars in 1961, Peter Agg was attracted by the idea of producing road-going sports cars and rescued the Courier and further developed the car into the mid Sixties. Trojan subsequently worked closely with the reformed Elva Company during the period, developing the successful Mk.VI and Mk.VII sports racing cars until finally taking control of Elva Cars during 1964 when the beautiful GT160 coupe was conceived. At the end of that year Peter signed an Agreement with the Bruce McLaren Racing Team to produce ‘customer’ cars initially designated McLaren-Elva and built by the Elva team at the Rye premises until production moved to Croydon. The cars were hugely competitive and reliable with Peter at the helm of the Trojan Group of Companies and of course he would later oversee the Trojan venture into F1.